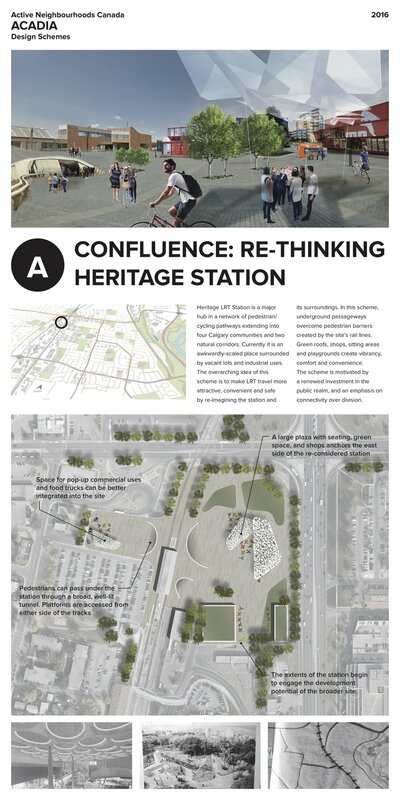 Four schemes devised at the 2016 Urban Design Invitational were presented to Acadia residents at Neighbour Day in June 2016 and the Stampede BBQ in July 2016. Locals cast their votes and provided feedback. Here’s what we brought, and scroll down for what they had to say. The winner?? This was an extremely tight race, but Acadia Village Pop-Up Plaza (D) won it in the end! Close behind was the Confluence (A), with A Green Welcome (C) and Re-imagining Bonaventure (B) Drive tying for 3. We’re currently ‘scheming’ how to implement some of these changes, and will keep you up-to-date! Already pilot projects hit the ground in March 2016, courtesy of the City of Calgary and Safer Calgary’s Safe and Smooth Symposium, with feedback gathered from drivers by Calgary Police. Woot! The idea of bringing business to the corners of Heritage and McLeod – awesome! We need a coffee shop! Would love to fill all that empty space at Heritage/McLeod with businesses. Will give us things to do. Outdoor workout equipment there would be great – pump iron while waiting for the bus. I think there are City $$ for this. Put the equipment where the people are. When cycling, this intersection (Heritage/McLeod) takes forever. Can pedestrians go over the traffic? Sure would be nice to walk or cycle more! Coffee and tickets should be available at stations! This is the only city where not available. Getting across McLeod is the problem! Takes a long time, not pleasant. Underground access to Heritage Station – ok if well-lit and manned. If manned, then yes. In Toronto, there are always people around, which makes underground passageways feel safe. I use the LRT frequently. The current overpass is ok, it’s working. Underground passageway would be much better. I am a 5-year resident, and I don’t drive. I take public transit frequently. One more bus to COSTCO/IKEA please. Yes, please improve sidewalks. Sidewalks on both sides please. 7/11 – no sidewalks to get there on Bonaventure. Makes McLeod Plaza inaccessible. No doors on back or side of the Co-op. Deters local traffic. I would walk to the Southland LRT if the walk felt safer/ had sidewalks. Keep street as is (don’t narrow) but get more green space and sidewalk too. In 70s, Bonaventure was a back lane. That’s why it is the way that it is. Why are the sidewalks on Bonaventure so close to the street? Too close to cars! I like the idea of redeveloping this for pedestrians and improving access to shops. Would just take someone on their cell phone for a second for an accident to happen, with the sidewalks as they are. Acadia Recreation Centre needs better bike racks. Businesses need more and better bike racks. Don’t know about traffic circles – one in McKenzie Towne is bad. Not pedestrian friendly. Can we have street lights that change at night based on a sensor? We’re in a playground zone on 88th – people drive too fast. Roundabout would be awesome – as cyclist, the light doesn’t change for us. People are not driving smart at this intersection. Would improve my commute on bicycle significantly. People come to the community garden because it’s a destination. 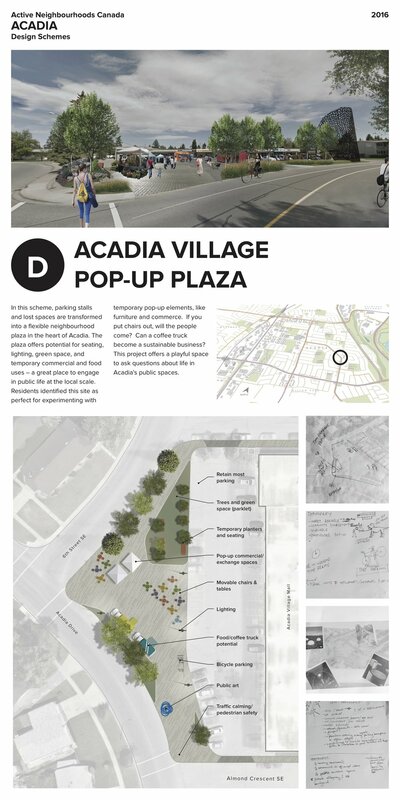 We need more benches, picnic tables, gathering places and BBQs in Acadia. They don’t need to all be in the same place, but if you could access them all on a green loop through Acadia, that would be awesome (bike racks, benches, BBQs, picnic tables, gardens, park aminities, bike stands and fixing stations). Bike Fixing Station at the community garden would be great – we want that! Roundabout with high school drivers would be … interesting. But I like traffic circles. Nowhere to sit in the shade in parks – parents roast. Also, I’ve seen those water fountains that attach to fire hydrants. We should get some of those. We need more public washrooms for seniors, parents, children. Athletic loops through the community would be great! (Hurdles, etc.) Mobile adventure playgrounds. Gets people circling the neighbourhood. Spreading the wealth. Nothing is currently aimed at teens, and no water parks. We would host pop-up sprinklers at the Community Garden. Loop in the Community Garden folks!! Government should support this work in communities, that make them more vibrant. New 7/11 – nowhere to sit. We would love to help create an even more vibrant site. Community orchard expansion + more community shared beds. Love your (ANC) ideas! Sure there are enough people to support a coffee shop here. Tim Horton’s is always packed. This space is very quiet. This concept will bring more people? Dangerous corner (6th/Acadia) – people turn too fast! Kaffeeklatsch portable coffee shop would be a good pick. I love the 94th street community garden. Who harvests it? Such an empty space – parking is always empty. Opportunity to do something here. Coffeee shop would work. Currently the Italian Centre is my favourite splace to hang – they have coffee and the soccer World Cup. Having people/furniture near the street makes people think differently when they drive through. This is a cut-through. Your idea forces people to say “this is a neighbourhood”. 6th/Acadia is a sweeping corner. I don’t cross there. Bump out is great. Italian Centre – so busy cause you can sit and have a coffee. Nowhere in neighbourhood to get a good coffee! I like this one. Please put bike parking here. Not a lot happens here, and so much parking. Thumbs up on this project.